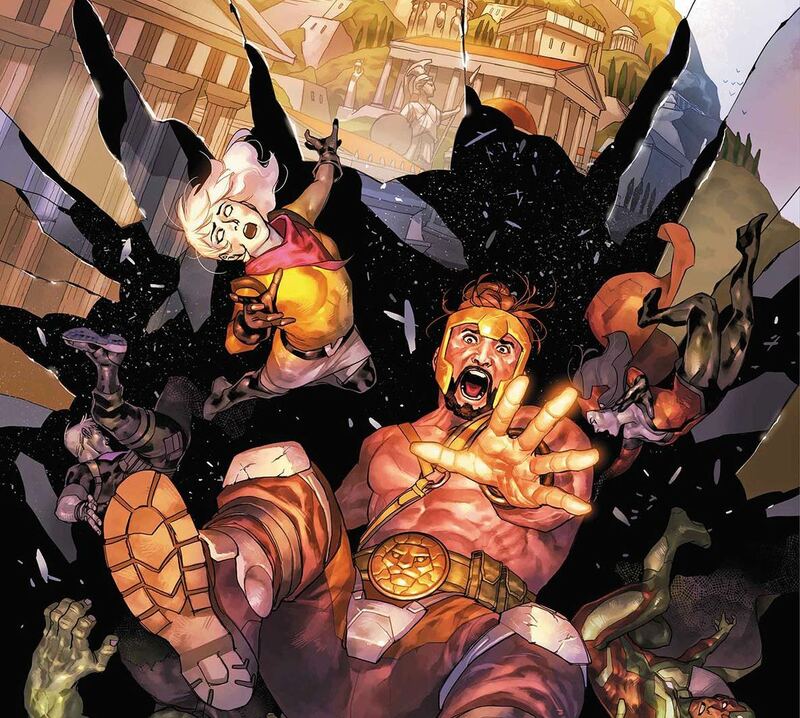 Avengers: No Road Home #1 Review – AiPT! Exceptional character writing puts this over the top. Jim Zub, Mark Waid, and Al Ewing have worked up a sequel of sorts to their smash hit Avengers: No Surrender and it appears they have not skipped a beat. Avengers: No Road Home drops readers into a story with multiple characters recapping where they are and ready for a new challenge. This time though, it’s personal. Paired with Paco Medina on art, Zub, Waid and Ewing’s story focuses very heavily on Hercules and his side of the universe. The Greek gods that he calls family have always been an element of the character and in this issue alone that all gets taken away from him. The Greek gods knew how to party. It’s hard to read this issue and not marvel and how good of a handle these three writers have on the characters. Hercules is the perfect amount of pompous yet endearing. Rocket Racoon is the perfect amount of sassy and grumpy. And so on and so forth. Every character that appears sounds like themselves, which should mean a lot to longtime readers. As the story unfolds we catch up with characters like Scarlet Witch and Hawkeye, helping to flesh out what the team will be once the characters realize the tragedy that has occurred. That tragedy involves Hercules family in a big way and it’s exciting to see Marvel tackle this corner of their mythos since it has typically been neglected. Aside from the characters mentioned above being written excellently, it’s fun to see Hulk and Voyager turn up as wildcards. Voyager is a newer character introduced in No Surrender and it’s fun to see her stretch out a bit and be the hero she is inspired to be. Meanwhile, Hulk is still coming from that horror angle, looking scary but also acting in a cold and yet calculated way. It’s a nice mix up to the usual Avengers lineup. Paco Medina draws this issue with inks by Juan Vlasco, colors by Jesus Aburtov, and letters by VC’s Cory Petit. There’s a clean style afoot here, and clean colors to boot, especially with skin that is easy on the eyes. There’s plenty of detail, but also a warmness that fits the Avengers. The angular and horrific face of Hulk is preserved from the Immortal Hulk series and Hercules’s athletic look is preserved well from the armor and musculature of the character. The positivity and warmness of the art almost lessen the horrific things that occur in this issue. Real murders take place, and yet the art and color imagine it in a way that’s almost Disney-like. It threw me off a bit and dulled the impact of what the characters were witnessing. The issue doesn’t quite articulate where all the characters (and for that matter the Avengers) are when the story starts. Iron Man, Captain America, and a few others aren’t involved. I suspect this is Avengers B-team of sorts, but I was interested in a bit more context. A good first issue, especially for longtime readers of the Avengers. The writing team has done an excellent job capturing the unique voice of each character while the art captures the wholesome positivity of them as well. It’s exciting to see Marvel tackle an often unused corner of the universe and I can’t wait to see how they flesh it out further.